Remember how I said SWTOR was my last MMO? Yeah well. 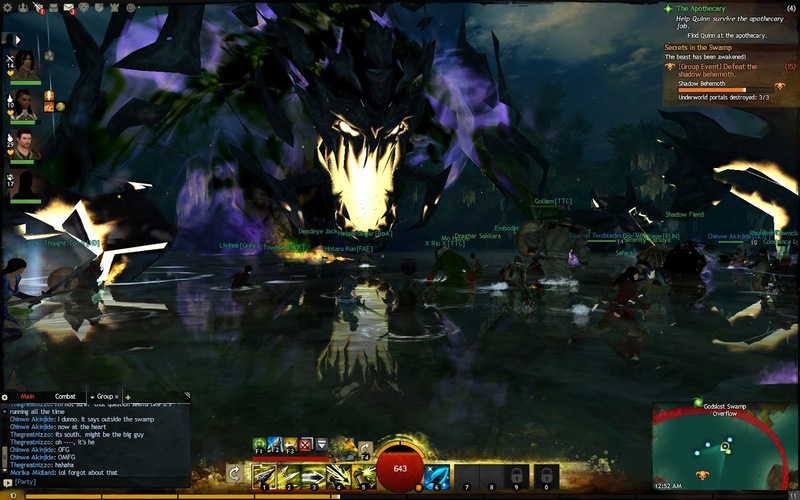 Guild Wars 2 happened. It’s been two weeks since I started and all other things are currently on hold as I play around with my Warrior, Necromancer, Elementalist, Engineer and Ranger. And when I’m not playing around with them in game, then I’m playing around with colour-coded spreadsheets about them as I plan out their adventures. 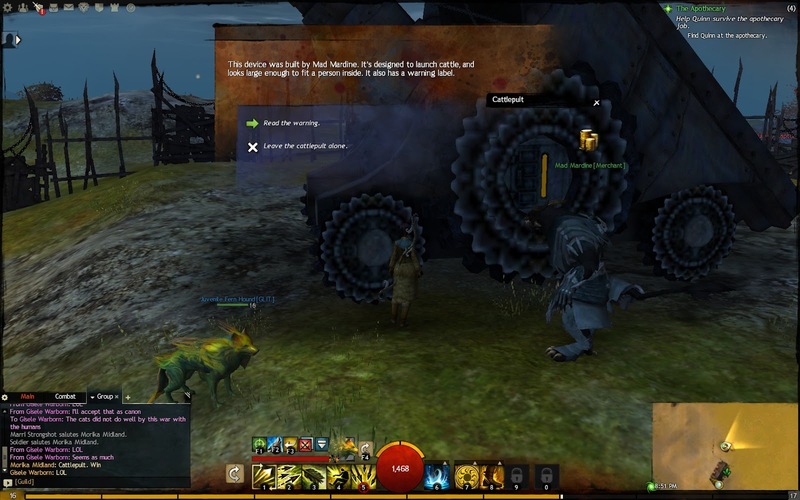 It’s still early times, of course, but I think this is all a good sign for the future of Guild Wars 2 in my life – and in my husband’s, who spent a mere few hours taking up one of my precious character slots to toy around with the game and subsequently ran out to get his own copy. He and I have been looking for a game to play together, but all of our attempts have failed thus far. I can see a lot of potential with GW2, though. He’s a crafter and is already level 40 just from crafting and farming, but his farming plus the game’s level capping means that we can still hang out together from time to time. There are a lot of things that I love about this game, so far, not the least of which is the exploration. You are rewarded for taking the time to explore, not just with experience points and goodies, but with the beautiful music and scenery as well as the lore. There is a lot to learn just by taking the time to click on a few books, NPCs and statues. Our exploration amusement has since been augmented by the realization that Bioware voice actors are allllll over the place. Grunt hangs out in the Charr priory, Duncan is hiding among the Wardens (oh I see what you did there! ), Anders is playing with fire, Kai Leng is going to be my mini pet and Fenris is whispering sweet temptations to me from the Nightmare Court. Oh right, Felicia Day is there too. Sigh. Just kidding. I don’t hate her, remember? And at least her character and purpose aren’t the self indulgence that Tallis was. Despite me always being about The Story in games, I have not gotten very far in any of mine and can hardly judge how good they are, though they do feel a bit superficial at the moment. Still, I do like the way they differ based on your character creation choices and the few choices you get to make along the way. And again, they focus on getting you out into the world and exploring, once again rewarding you for doing so. To be fair, I should list the cons of the game, but they are so minor or are related to MMO launch jitters and soon to be cleared up, if they haven’t been already that it isn’t worth it to mention them. My husband has complained that things are a little too easy and convenient, but I keep looking up at his screen to see him dead or dying, so I’m going to assume there’s still just enough challenge involved. I do understand what he means though, considering he used to play Final Fantasy XI with me. Back in the day, things were challenging. You couldn’t get to level 80 in a day. But while I appreciated those challenges and took pride in my accomplishments as an individual and in a group, there was also a helluva lot of frustration involved. As much as I agree that things are being made too convenient for gamers these days, I really can’t complain about the lack of stress and frustration and the ability to accomplish more individually or in a smaller group. I love that, even for those like my husband who prefer to do things on their own, they are still able to participate in group events, even in passing. Mobs are shared (as are gathering points), so there is none of the annoyance of camping or kill stealing. It’s to your advantage to team up with others, even if not in party, to take down a monster, since everyone is going to get their own loot pot. Crafting is also my husband’s thing, where it was never mine. But we’re both enjoying it. I’ve even got plans to level one of my characters mostly on crafting because it’s so much fun. I’m sure there are many guides available, but I have no interest. Discovering new materials and recipes is half the fun. 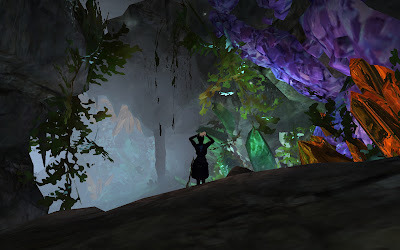 I still have to check out PvP, WvWvW and dungeons, but I’m in no rush to get anywhere and farming and crafting – things I’ve hated hated hated in the past, are just so much fun, especially when we can enhance them with guild bonuses, which is how I’m building our guild. I’m leading a guild again, but feel far less apprehensive about doing so because of how guilds are set up and the fact that people can represent more than one. Technically speaking, this game is brilliant. Aside from the horribly amusing coincidence of my computer having a big ol’ crash the moment my husband asked how the game was running, I have had absolutely no issues. Sure there have been the occasional shut downs and connections losses, but they are nothing compared to the lag frustration I’ve had in some games that have had me give up trying to play them. I can alt-tab to my heart’s content without the back and forth taking five minutes. And let us not forget the big plus of GW2 being free to play and actually understanding how that works. As in, you aren't nickle and dimed over game elements that are necessary to game enjoyment. You aren't locked out of anything because you are poor. If you want to pay for a few extras, they are merely for convenience or personal expression, and yeah okay I'm totally buying those outfits shut up.... 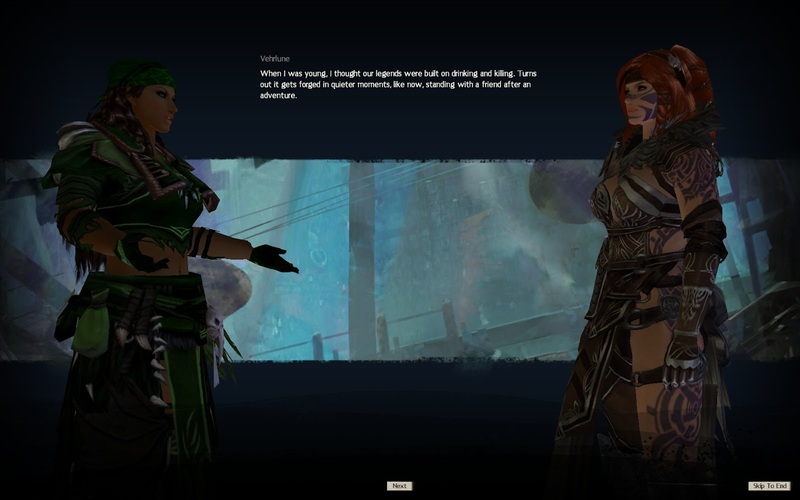 I am very happy with ArenaNet's microtransaction philosophy, along with many of the other philosophies they have displayed thus far.